I usually don’t make a huge deal about my birthday, but this one is particularly special. It’s not the number. It’s that a year ago, I wasn’t sure I’d live to see it. Just over a year ago, I was diagnosed with breast cancer. My diagnosis felt like a death sentence. It wasn’t, but I didn’t know that at the time. I was completely unprepared. Not knowing anyone else who had it, I had no point of reference for what lay ahead. I told my immediate family and a very select group of friends. Each of their reactions was another small hell, as they tried to grapple with the news. But that was nothing compared to the barrage of questions from health professionals as I began my treatment. They all wanted to know how I had developed cancer so young, and their questions felt more like accusations. Aren’t you in your thirties? Is there family history? Are you a smoker? I was at a loss to answer. I had no close family with cancer. I don’t smoke, or drink. I’m thin, eat well, and exercise. With each question, I was tempted to confess that I’d bought cancer at the store, that I ate nicotine like gummi bears, and that I googled “cancer-causing areas” and built my house there. At the end of every appointment I felt like punching someone in the face. That I was never snarky, or violent is a testament to how emotionally exhausted I was. I listened politely, told jokes and reassured everyone that I was handling things fine. I lied, lied, lied. But I was lucky, as lucky as you can be with cancer. It was found early. How had my doctor found it so soon? The answer was luck. 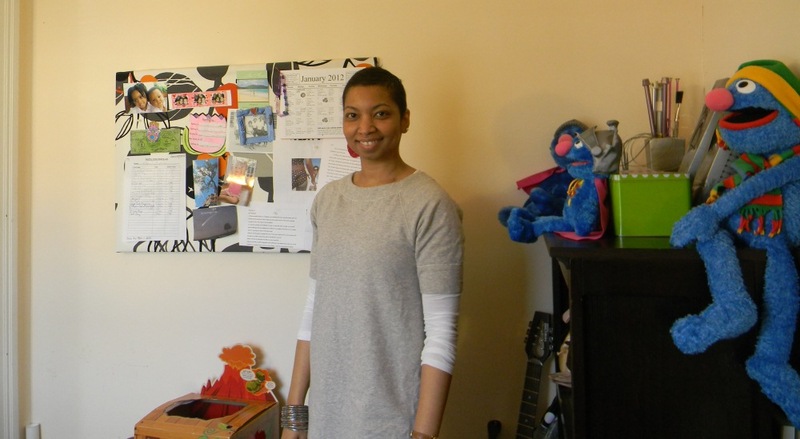 It was luck that made my OB/Gyn send me for a mammogram a few months after my son was born. It was luck that the radiologist’s office did follow ups every two years. And it was luck that I was due for a biennial mammogram before the cancer got any larger. This was only my third mammogram. Women my age wouldn’t normally get screened for another six or seven years. Luck. At BooksNJ. My hair was gone a couple of weeks later. Working from home was a huge bonus last year. I could maintain a pleasant public façade and keep my terror private. I planned my son’s 5th birthday party, met friends for dinner, movies, drinks. I helped with other people’s wedding plans, chatted on Facebook and Twitter, kept working. All the while, I was having surgery, recovering, and then beginning radiation.The annual Kid Lit Drinks night after BEA presented my first public dilemma. I was still getting radiation, and I couldn’t wear deodorant that contained aluminum (they all do). Drinks night is notoriously crowded. And crowds mean sweaty pits. Would anyone notice? If they did, could I blame the stink on another author? In the nick of time, a friend found a non-aluminum substitute so my pits wouldn’t offend. My next public appearance was the BooksNJ event in Paramus. It was a bright, sunny day. Thank you new deodorant! It was also my last public appearance, and as all the authors were required to have their photo taken, it was also the last picture taken with all of my hair. Chemo was on the horizon. I delayed it until the end of the school year so I could palm my kids off on my parents in Trinidad for the summer. Then I only had myself to think about. Worried friends came to help. I was so grateful for their company, I wanted to cry. I didn’t. They were concerned enough. My hair started falling out the week that a friend had come in from New Mexico. Another friend drove up from Pennsylvania, and a third took the bus over from New York. I enjoyed their company, and kept my hair in a ponytail. After they were all gone I washed it, and huge clumps came loose from my scalp and got tangled in the hair that was left. I stood in front of the mirror with a pair of scissors for an hour, but couldn’t figure out where to begin cutting. When my husband came home from work I was wearing a scarf over the matted tufts of hair that were still hanging on. He shaved my head and made me look in the mirror. “You have a perfect head for being bald,” he said. It wasn’t much of a bright side. I started wearing scarves, and avoided reflective surfaces like mirrors, pots, puddles, and other people’s eyeballs. 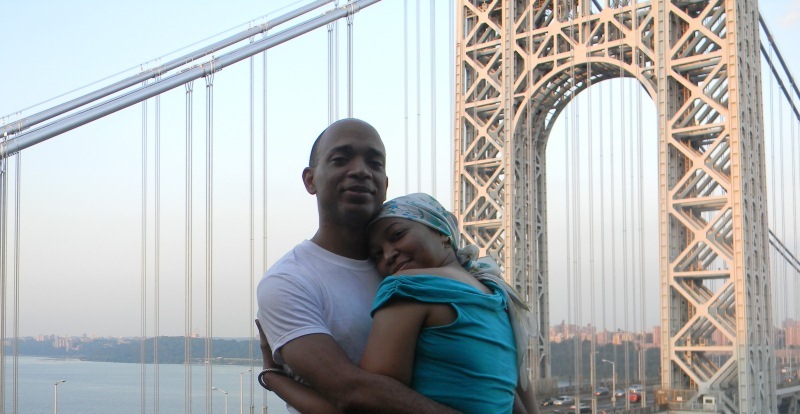 I avoided photos, but my cousin managed to take this one of Darryl and I the day before our anniversary at a park overlooking the GWB. Somehow, I made it through the three months of chemo. I’m still in treatment, and will be for a few more months, but the really tough stuff is over. Good thing too because by the end, I was sucking blood like a vampire just to hold my head up. In the hospital they call those blood transfusions. They’re super fun. A few weeks ago in my office. The return of the 'fro! Over the last year, I learned things that you can only find out the hard way. I worry less. I do more. I started my own business. And today I celebrate not just a day I wasn’t sure I’d live to see, but I celebrate making it through the last year with my sanity and my body mostly intact. And today, I’ll be doing something I love: reading to kids. 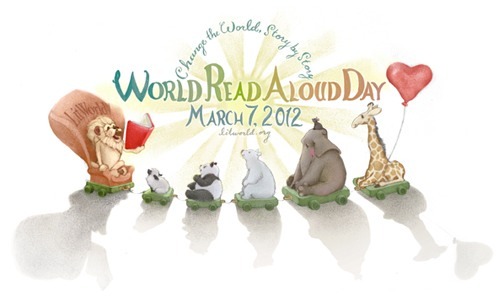 I’m reading to two classes for World Read Aloud Day via Skype, and then in my own kids’ classrooms. And then I am going to eat a giant piece of cake for lunch, because if there’s anyone who deserves a giant piece of cake, it’s this birthday girl. Wow, Tracey! I’m so sorry you’ve been going through this all year. How difficult and terrifying…well, I’m sure my adjectives pale in the face of reality. I’m so glad that you are through the worst of it now, and I’m sending you lots of good wishes for the rest of your treatment and recovery. And yes, I’d say you deserve at least a giant slice of cake today! Happy, happy birthday! WOW girl! You have my teary-eyed (happy ones of course) gigantic H A P P Y B I R T H D A Y wishes. You are one strong person, and I applaud your take-action, she-means-business approach to life in response to such an attack. And I must say, you are gorgeous with and without hair! Thanks, Britton. It was a rough year, but now… we dance!!!!! Dance . . .Dance . . . Dance. With words, and without them. 😉 And, yes, Britton says it so wonderfully — you are gorgeous with and without hair, which is nothing more than a reflection of a deep inner beauty. Such a wonderful reflection here on spirit and serendipity! Amanda, you know I could not have made it through this year without you! Thanks. I love YOU! Treacy – I don;t think it was luck- you still have lots to do and being here for us is one big reason! And your writing is so inspiring. Happy Birthday, every day! Love the afro. if only my hair could do that, oh yeah, and look that good too! You are so amazing!!! Happy, Happy, Happy Birthday! Awwwwww. So touching! Happy birthday! I love your blog! Thanks for the birthday wishes, guys, and thanks for stopping by the blog. I am about to eat a GIANT cupcake!!! Sugar high, here I come! Beautiful through and through–you as a person, you as a writer, you as a wife and a mom, and you as somebody who makes a difference. You have much to celebrate, and so do we because you shared this with us. Thank you. Have a wonderful day, Tracey, and eat lots of cake! You are an inspiration, Tracey. I’ve been through the ringer with my youngest daughter’s cancer, and like you–I’ve come out the other end stronger and more appreciative of all the blessings in life that are offered to me every day. Such a beautiful post. Happy Birthday–you deserve to celebrate! Thank you. I hope your daughter is doing well now! Happy Birthday Tracey! Enjoy your special day! And thanks for sharing your story! It was a great reminder that every day is a miracle!!! Thanks! Thank you so much for sharing your story. My mother was a 43 year survivor. Happy Birthday! Happy birthday lady. Here’s to many, many, many more giant slices of cake. Thank you for being my friend. Thank you for being such an amazing, brave, awesome writer! Love you girl…now go eat cake for dinner too! Thanks again, all of you. Kari, here’s to survivors! TBap! First, I want to say you for writing about this. You’ve got courage and we women need to hear these stories. Second, Happy Freaking Birthday! Hope you’re living it up! Happy Birthday Tracey! The world is a better place with you in it! Wow Tracey – what a heck of a year!!!! My hats off to you for keeping your sanity throughout last year. As I head off for an operation to fix my ‘bits’ tomorrow, I draw strength from your bravery. Happy super-special birthday. Hope you celebrate in style and eat many slices of your favourite cake – you sure have deserved it! Such courage and beauty! Thanks for sharing, Happy Birthday! Tracy, I’m reading with tears in my eyes. I’m happy that you’re made it through and had good support because until I read this I would have never known from your demeanor on fb or in any of your writings. God bless you today and always. My prayers are with you. Happy Birthday. Tracy, Thank you for your profound and inspiring story…a testament to your strong will and the loving spirit of your family. Happy Birthday. I wish you many more as happy as this one is. You need to have birthday cake EVERY day from now on my friend – life is a celebration! 🙂 Be damn proud of those candles. HUGS., And Tracey..one other thing…I NEVER want to play poker with you! Ha! OK, no poker. Of course now I have the Lady GaGa song stuck in my head. 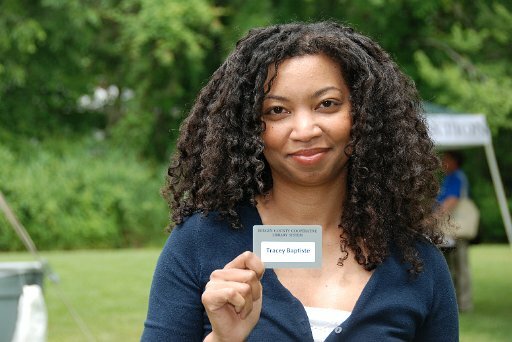 Congratulations, Tracey, I’m nominating you for the CANDLE LIGHTER AWARD! Swing by my blog today and see your name in bright lights! Tracey, I just read this! So sorry I missed it when you posted it. Here’s my Happy Birthday to you in virtual song 🙂 AND my hug to you for sharing what you’ve been going through this year. I am so happy you’re getting better and that you’ve allowed us the chance to cheer you on. God bless you, Lady!